What a night in the Big Brother 2014 house, as the new Head of Households were trying to come up with a plan of attack for the Week 3 nominees on Big Brother 16. Derrick had a plan, but Nicole is starting to freak out (or put on a good act) and may mess with the plan. Not all plans work out on Big Brother, which we all know. The Nomination Ceremony has been held and find out the nominees below in our Big Brother 2014 spoilers! Our Live Feeds recap from last night gave us a look into what the new HoHs were thinking. We all know that these HGs change their minds and alliance a lot, so one can only hope this week goes as smoothly as Derrick is hoping. It is starting to crumble already, as Nicole is starting to go a little loopy with the new power and she does not want to hurt anyone. She is a BB fanatic, but has she ever watched the show really? She is playing with emotions and you need some blood on your hands eventually, but her nominees would be pawns anyway. Get it together, girl! No big shocker here, but it looks like Caleb will throw the Battle of the Block competition to take Amber and Donny down (thankfully). The HGs will try and backdoor Devin, but he jumping around the house and talking with Nicole now and knows he will be backdoored and must win Veto because she just freaking told him! This is going to play out very interestingly! What do you think of the nominees on Big Brother 2014 for Week 3? I am losing faith in Nicole….why couldn’t Christine have won it??? Hi, Todd! Thanks for giving us the opportunity to “get together” for what promises to be a much better summer than last year–of course, getting over that hurdle wouldn’t take much! I agree with you about Nicole–how could she do that!! When they first intro’d the cast, Pow-Pow was on my list to go quickly but then when I saw her with Donny, I changed my mind. I hated to see her evicted but I loved her response to Donny’s bye-bye message. oops, I meant to type one message to Todd and one to you but hit the button too quickly! I felt the same way in the beginning about Paola but I grew to like her as well and hated to see her go – there was definitely others I would have licked to see go before her. I loved her connection with Donny, so sweet. I wish she had put up Victoria instead of Donny. But Victoria whined her way to safety this week. I just hope Caleb sticks to the plan and throws the comp. Yeah, I don’t get it at all….especially when she knows the game! And now Hayden is saying he would keep Caleb on the block is he wins! This is going to get so interesting! Like most everybody, I love Derrick and Donny and Nicole and Christine and was distressed to hear that Nicole blabbed to Looneytoons–why??!! I just hope he doesn’t get picked for the POV. Thanks so much to all of you have have live feeds and keep us up on things. I don’t even have HGTV so even miss the freebies. P.S. Thanks for all the chuckles, laughs and belly laughs, too! When I am feeling down, I know I can always count on you guys for some therapy! Tessa!! So good to see you’re back with us. You’ve been missed. Cat and Lilly, thanks! As usual you two and all the other members of the summer of 2013 gang have been keeping me very entertained. Aren’t we all glad that so far we actually have several HGs to cheer for without having to hold our noses! And the villains make it so easy to dislike them! Thanks! Good to be back but here I am having taken a couple of hours off and now have come back to see that Derrick is not behaving and Donny may be in trouble!! NNNOOOO!!!!!! If they don’t get rid of Devin and Caleb soon this season is going to go downhill fast. Tessa! Welcome back!! (Like your disqus screen name….) Hope you can check in regularly!! Hi, Mary! Been enjoying hearing from you, too! Uh-oh, how did I make you cry? You must have been able to see all the clutter in my house, LOL! It would be enough to make anybody cry. I don’t know if you have access to the “Hoarders” program in Canada or not but I think it might actually make you cry–the people on the show have a legitimate mental disorder which makes them unable to throw away anything to the point where they are often in danger of being evicted from their home. Sometimes I do shed a few sad tears whenever I catch an episode. I am always so happy when they are able to be helped. P.S. That’s a very nice photo on your profile. I said you made me cry because you said so many wonderful, kind things about everyone here and you just really touched me. I agree 100%, all the people on here are great! I do know about hoarders – I helped a very dear friend of mine sort her place out. It’s an illness and I would never think any less of a person with that problem. Thank you for what you said about my photo. Best wishes! Awww…thank you! This really is such a wonderful group and with the changes, maybe we won’t have those no-so-nice troublemakers who showed up to post last year–the ones who would get mad and say they were leaving but then they wouldn’t go! Tessa, Welcome back!! You have truly been missed. Now that school’s out for the summer, hope you can check in more often. Thanks, Joyce! I am sure I will be checking in a lot — you know how it is — housework is so exhausting that frequent breaks are a necessity!! As long as there is a clear pathway to my computer, I’ll be OK, LOL! 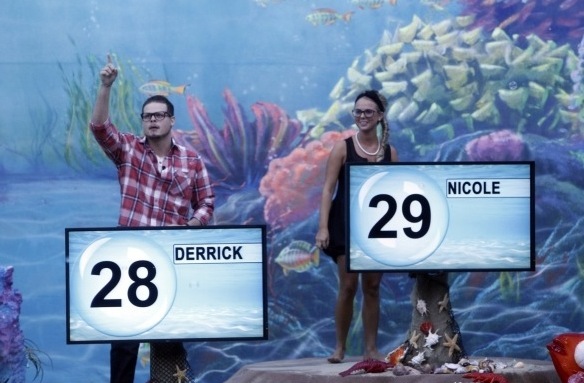 Derrick said Nicole got to pick first. Not that it really matters. LOL…Amber tells Caleb she doesn’t like being against people she adores. Hmmm….he’s thinking “she loves me”. But i’m quite sure she meant Jocasta. I cannot believe these players this year. I truely think only 3 or 4 players have even seen the show before by the way they are acting. Frankie and Derrick have to protect Donny somehow. And now it is time for Nicole to go home These people act like they have never seen BB. Derrick is the only one that acts like he has any sense. They all talk to much!!! Nicole needs to get it together!!! I’m not convinced that Caleb will throw the BTOB comp, especially if he has ANY reason whatsoever to believe that there’s the slightest chance he’s going home. He’s too much of a competitor. But i also think that Amber and Donny can win on their own depending on what the comp is, so Derrick’s plan may work.out, even if he hits a few bumps in the road along the way. If Caleb and Jocasta win, i still think Nicole can be convinced to take Donny down (if POV works out that way) and put Devin up as a renom. I agree. It’s entirely possible that Donny or Amber could win the comp on their own. But the only reason Caleb will throw the comp is because his “Queen” would be in danger if he didn’t. If he does throw it then him and Jocasta remain on the block. At this point the veto becomes the all important deciding factor as to who goes home. I don’t know why all these people think they can win a comp when they haven’t the slightest clue as to what it will be. Just a random question but did anyone get a chuckle last night when Julie said “Everyone, i need you to have your balls in hand”. lol…maybe it’s just me. Oh my gosh, yes! I couldn`t believe not one person cracked up. I thought okay, I`m turning into a dirty old woman – I couldn`t believe what I heard – too funny! Ha! Careful. Santa may start paying attention! Hi Mary, (off topic) Thanks for the info on ” The Amazing Race Canada” I watched it and loved it. Thanks. I think they will eventually as the show becomes more and more popular. I hope so. I’m a proud Canadian, but a change of scenery would be good. It will work out ok along as Devin does Not play in the Veto. Then they can nom Devin and vote him to go home. Let’s keep our fingers cross he doesn’t get picked for the Veto Comp. Hi everyone. I have always read all your posts and comments and thought, why not join in. Thanks to all for keeping us up to date on the house. Go Donny!! unfourgven1, Welcome!!!! You will love it here. Yes, Go Donny, Go!!! I read the posts and comments here for a couple of years before diving in last season to vent my frustrations. Welcome! Glad you’re joining us unfourgven1 – the more the merrier! Now let your posting commence!!!! We want to hear from you. unfourgven1, welcome to the Big Big Brother blog. It’s nice to get fresh ideas. We’ll be looking forward to your input. I’m sure you’ll fit right in! I would so love to see this when you become a HG on BB!!! LOL…but the voices only speak when i tilt my head to the left. If i tilt it to the right i can pick up CBS without an antenna. LMAO, Cat you crack me up. Lilly I like that post! Still hoping that Cat does decide to do BB one of these seasons. I remember all the comps that everyone came up with if they decide to do a ‘mature’ cast…..Now that would be entertainment! Oh, Cat, I just luv u! Donny and Amber won BOTB.